A friend phoned a few minutes ago and asked during the conversation "How do you feel about being stroked?" Feel. Not a sausage. I could give you a list of what bit's do and don't work, but it's what I have, or not, and it's nowt to do with the price of fish. I'm more interested in that I can do. Stroke isn't something I chose. It happened. Feelings don't come into it. I do what I do, and ummm, maybe a little aggressively, promote that. I'm a husband, father, and head of my family, as is my duty. The closest I come to feelings on it, is that it may change one day - just not yet. Had some good news. The family that owns the mother of our dog were reported to the RSPCA for allegedly illegally breeding and mistreating dogs by one of their neighbours. Nor had they set out to make a profit. When they offered pups to homes, people would offer them money - as we did for Sigma. They didn't ask for money. I found out when the lady when the RSPCA phoned me. The head of the family, obviously upset at being reported, told her I'd be happy to confirm they look after their pets. Indeed I was. More, I was able to tell her they'd even go without food themselves to feed them. I know, because Bear keeps an eye on them, and we find little ways to help out. Daft softie is my Bear. The good news is the lady from the RSPCA closely questioned them, and satisfied the couple of dogs and a cat they have are otherwise well cared for and well fed, made an appointment for them all to be neutered at a local vets, giving them over £300 in vouchers to pay for neutering and vaccinations. In return, they were able to point the RSPCA to a local pet shop which able to supply pet food at a rate almost 50% cheaper to the public than the local RSPCA branch are paying retail ! Trixie :) Trixie, Sigma's sister, if you remember from a previous post, the nibbler, chewer, and destroyer of female underwear, socks, slippers and anything else (Yeeuk!) we re-homed to a family with a car and access to the countryside. The family, mum, dad and two lads of 8 & 10, had a pet stolen, and wanted a replacement. After initial resistance from hubby, (the word 'free' works wonders) he reluctantly agreed. Trixie has been passed from pillar to post because of her nibble habit. Anyhow, seems they like to walk for miles through woods and fields, (hyper kids, mum says) and around the Derwent and Ladybower dams. Hubby knocked on my door yesterday. I thought "Uh, Ho". But no. He says Trixie was a bit nervous for a couple of days (pee'd on their bed). They'd planned to get a 'doggy cage' so she didn't chew at night. But, he explained, she's followed him all over, loves to run in the woods. She's discovered if she jumps in a river she can cause havoc amongst ducks, and she shouldn't mess with sheep. Tried to give one a lick apparently. Bad move. Sheep won. She sleeps on the bottom of their bed, and hasn't nibbled a thing. Only thing he would complain about is a wet sloppy tongue up his nose when the alarm goes off. Nibbles? Not once. She's due to be neutered and chipped next week, and embarrassingly, he shoved £50 in my top pocket to pay for the vaccinations we'd done. Worth every penny, he says. Then he opened my front door, whistled, and we were flattened by a ball of wet slobbering fur that hammered around my living room knocking everything over. Bless her. True, supermarkets are handy, but they only sell where's there's a profit to made - you won't get sunflower seeds, olives, anchovies or pine nuts for a pesto at our local supermarket. No demand for them locally. I use what I have, because no one ever saved money by throwing anything away, and I like to forage for herbs, flowers, wild garlic, blue berry's, blackberries - the list goes on, because I want to. I love the brief opportunity to get out with my 13 year old for a short while, to learn more about the local flora, and pass on that knowledge, and preparing herbal medicines and cook for the family. Despite having a disastrous couple of years for various reasons growing veg, I've been able to forge links with locals with a surplus, overgrown gardens and allotments (I Dream of being able to work an allotment) . My eggs, duck and hen, come from Bolsterstone, my cucumbers and tomato's from little village green houses in Stocksbridge, my cooking and medicinal herbs from, golly, from within garden riches within 25 yards they never knew they had. Another neighbour says their getting "maybe a couple of chickens" in spring. The modern city way. Plastic coops, small plot. Problem. Chicken poo, fox. Foxy and I are old friends, the skinny idiot too-tame twit. He's no problem. Advised her how to set up a pen (bury the chicken-wire 18" down, 4' up) and chicken poo is an excellent fertiliser, we'll clean that up and compost it. Bear, Tots and I will feed them while their at work. For whatever eggs they can spare. I can't get the hang of my beloved Bear chatting on Facebook to our next door neighbour. Wheelie Manor is a 'semi'. Shout loud enough - sorted. I've just looked over her shoulder, and the conversation was going something like "I'm just going to make myself a cup of tea, you having one?" "Same here, be right back". A couple of minutes later and cuppa in hand, "That's nice - where were we?" Blimey, that was fast. Bear was explaining over the fence to the neighbours on the other side about Trixie-bell the pup consuming various pieces of underwear, my 13 year old's favourite shoes and soft toys, my travel pass, and other bits and bobs. In one night. Her daughter in law, visiting, overheard and volunteered she'd have her. I thought I'd misheard, so I repeated what Bear had said. She explained they'd had a Rottweiler pup stolen a few weeks back, her kids were pining for a dog, and they were quite used to 'a chewer'. And promptly offered to give us the money for the vets fees we'd incurred. Trixie is a Heinz 57 variety, mostly greyhound, and I was pretty keen to rehouse her to someone with a lot of space. It seems they live close to Derwent Dam, no sheep for her to bother, and the family love to go on long country walks. I may have mentioned this before, but I'm a keen, but equipment impoverished amateur astronomer, so free is good. I came across a free astronomy program that rivals a lot of commercial offerings. If you're into astrology (and they're much more closely linked in history than you may realise) It will display a massive (millions of stars - ask me how if you get it), and even overlay constellations as pictures. If you have a telescope you can plug into a computer, it will direct that telescope to your chosen point. There's so many options, their help file is out of date. Worth a look - Stellarium. Free Program. Hoowee, what a day. Eldest son moved to his first home. Well, correction, he's at work, so his mum, gran and granddad moved as much as they could fit into a rather large transit. I never knew a chap in his early twenties could accumulate so much stuff in one tiny bedroom. Thinking of modern technology, his mum advertised for a rented place for him on a local forum, and received a very reasonable offer for a partly furnished two bedroomed home a mile away owned by a Mr. Khan, the son of a city furniture dealer, who, the same age as my lad, owns a number of properties. All sorted out via the 'tinternet with a couple of visits. But the lack of furniture hasn't been a problem. My Bear had a quick chat or three with various mates on the same local forum, and lots of the ladies (and a fella) were chucking stuff like drawers, and the landlord unexpectedly delivered a new three piece suit. Sorted. Not bad for £400 a month. Not counting he's had an unexpected loan from the wife of a leader of a Christian Church to 'ease the burden on us' to bring his American wife across to the uk. Don't get me started on that one....Nightmare. Ah, Trixie Pup. Trix is 5 months from the same litter as our Sigma, but has been passed from pillar to post. Four owners as far as I know. She's a 'chewer'. She's untrained, undisciplined, and is accused of chewing everything from furniture to walls. Not here - well, the odd soft toy. And jumping up and down on me at 5 am. Urk! She's a pup. That's what pups do. So, apparently, I'm her owner, until I can rehome her. Strangest thing, I was singing to myself - we do that, very singy family. The poor thing sat fascinated but frightened in front of me, shivering. Maybe it was my voice? But do you know what? I don't thing she's seen a human sing before. How sad it that? I use amongst other photo archiving proggy's Googles (free) Picasa 3. Quite a useful facility is it's Face recognition. When I upload photo's from my camera and phone onto my system, it will look for a face or faces in a photo, and, at first, ask for a name for a face. Thereafter, it will attempt to match those faces to any that you download, import, or whatever. Hand on my heart, I forgot. So late last night, after letting eldest daughter loose with my camera with Charlie Anne, new granddaughter, I put them on the computer, and went to cook my tea. There I was, tossing me'bannocks (don't ask) to hear gales of laughter coming from the living room. My daughters had decided to have a look through the photo's I had of them. Oh, dear. Y'know that Lez Dawson picture? Yup, you've guessed it. I've given in. Thar'y'go. You read it right here. Giving in, as The Bear, aka, Er'Indoors, will tell you, is not my forté. She should know. They don't call her the Bear for nothing. Ah. 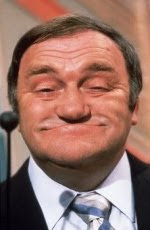 She's just read that over my shoulder, and would like me to point out that she doesn't look like Les Dawson. Hmmmm. Where was I? Ah yes. Giving in. Sorta. As I've posted before, I've had a string of people who seem to think I'm a bit of a nit-wit, and to be completely honest, they're 'on the make'. But I do realise that amongst the rabble are those that do have genuine need, often short term, aren't substance abusers and find it painful and embarrassing to ask for help. They're easy to recognise. A few more visits than usual, for a coffee and no more, and stopping less than an hour. They never ask for anything. Never complain, and are often fiercely proud. But as the visits get more frequent, and the weight loss and pale complexion become chuffin' obvious, I can't just sit there and watch them fade away. My Bear has a heart of gold. She'll grumble, she'll give them a nervous twitch, she'll feed 'em cup after cup of coffee. (Interesting combination). And boy, is she blunter than a very blunt thing. But she's even been known to nip out and drop a mysterious plain brown envelope through the odd letter box, after demanding someone's life history. Heck, she's even been known to take tea and sandwiches out to the Community Service young lads picking up litter in torrential rain. When and if I help someone out, I prefer a less direct approach. Raiding the fridge, freezer, tins cupboard, veg rack and eldest sons supply of rather awful reduced-price-supply of 'snack pots' he always forgets to eat. It's surprising what you can make from an (urk!) snack-pot, some beans and peas, an oxo cube, some veg. I don't mind cooking it for them, if they've no gas or electricity. Now, I have a family to keep, bills to pay, and oldest son is about to move into his own place. That isn't going to be cheap for us. So I've had to tell Bear, no more money out. My impulse, is to say sorry, can't help. There are churches and organisations I can refer them to. Jesus Army, Sally Anne, Archer Project ect, ect. But as Bear points out, that doesn't deal with immediate need. So we've agreed that when she shops, she puts a little extra on the shopping list of non perishables, and if anyone needs to know what to do with a few basic breads, pastas, veg and cheap meats, she'll show them. What pisses me off is that in 2010 UK, the people in need are no longer the smack-heads, blow-smoking, piss heads. They are families with young kids, pensioners and singles on low minimum wage incomes being thrown out to loan sharks. Not as you would imagine, wastrel, not-interested-in-a-job unemployed. Those are a minority now. Forgive me If I've already mentioned this, but the reason I use large text when posting is that many Stroke survivors have vision problems. I've just declined an invite to give an 'inspirational' talk at a city school. It was very flattering to receive an email, which I ignored, followed by a letter to my home. The fee they offered was extraordinarily large. It seems that the new deputy head was a former pupil who "remembered" me from many, many years ago "with great fondness", and "that I was an inspiration to him in the years after he left sixth form, and went on to University." Nice. One problem. I wasn't a former pupil, which to be fair, he didn't mention. But I do remember him. I was one of those kids lucky enough to pass some old-style exams early, while simultaneously attending university part time from the age of 12. Fast forward to the age of 20, and I was intrigued by an article describing an invention by a 14 year old at that school described as revolutionary. It had been granted a patent, and as they were having an open day, it was being showcased and always looking for an investment opportunity, I thought I'd nip along. To cut a long story short, there was a massive amount of visitors, and I was roped in to head a 'viewing panel' (Dragons Den, anyone?). Considering MY history, I knew a pretentious, annoying, jumped up little prat when I saw one, who'd re-invented the wheel, and I said so. More, I found myself in a huddle with a group of sixth formers (16/17 year olds), to whom I explained in minute detail that the world of work was a lot different to that they lead you beleive in education, and because you're qualified, it doesn't guarantee you a job - you have to compete for work like anyone else. I was firmly, forcibly, and forthwith, much to my amusement, ejected from the school by the Careers Master. That annoying 14 year old is now the Deputy Headmaster. I believe I've been gracious in turning him down, and I'm sorta pleased he's remembered me as an inspiration. I'm very pleased he's done so well - his income is a deal more than mine ~smile~ . I did a little research, and I've discovered that his school is about to be merged with another, and he's likely to lose his job . Bear pulled a face. "Dray, we've got nowt in". Phew, that was close. If She Who Must Be Obeyed calls me Wheelie, I know I'm on level green. She's trying to annoy me a little. If she calls me Dray (as in, large cart behind a brewery horse) then she's half way towards using my christian name, so I'm on amber, proceed with caution. Christian name? Red. Abandon ship, head for the hills. I decided it was safe to venture a hopeful "Yes dear? Nowt in dear?" - and catching that brief flicker of expression that only my beloved can pull, that in the past would would have got me points on my licence when I was allowed my motorbike, I braked, and shut up. When Bear says "we have nothing in", she means we're out of ready-mades. The alternatives, left to her own devices, are usually variations of Spag Bol. No Spag, plenty of Bol. Spag Bol between Pasta sheets? Lasagne. Spag Bol on (home made) bread, soaked in olive oil and wizzy wigged home-grown garlic? Spag Bol Pizza. So after determining that my lot are truly sick and tired of you-know-what, and lots of Yes Dears, No Dears and trying desperately to shake-or-nod my head in the right places, I came up with a variation of a quick and easy Mrs Beeston recipe she could do. I've always got a batch of home made (Wheelie Made) shortcrust pastry tucked away in the freezer. Don't need to post how how to do that do I? I use half-fat to flour, and freeze half. Once it's defrosted, you can knead in the seasoning and some herbs. For fat I always use unsalted butter. Melt some - you guessed it - butter in a pan with a spoonful of olive oil. Any oil is fine. Sunflower is fine, and walnut, sesame are tasty and handy to have around. But the aim is to stop the butter burning. Drop some chopped potatoes into boiling water for 5-6 mins. While you do, drop a couple of cloves of chopped Garlic, a chopped leek or two, and a rather large chopped onion into the butter-oil. Keep the lid on for five mins, take the lid off, and fry gently for another 5 or so until the leek, onion and garlic are soft, but not browned. By the way, s*d Jamie Oliver, use as much of the Leek as you want. It's just that the dark green bits take longer to cook. Now, don't tell my lot, but I add 1/2 teaspoon of Coriander powder and 1/2 teaspoon Mustard powder. I've even cheated and put in a crumbled Veg. Oxo cube instead. Experiment. Potatoes should be done by now. Drain, add to the Leeks, and add enough milk until it's about 3/4 way up the mix, add a pinch of salt and pepper, stir, put on a low heat until it just starts to to rise. No Lid. Stir again. The trick is to let a skin form on top, then stir the skin in. And again until your knackered and/or happy. That technique works with soups and stews too. When you're happy, pour it into your oven dish. If you'd like it to be thicker, either mix a little cornflour or mashed potato, or maybe a handful of grated cheese. Leave it for 10 mins. Bring it out, cover with your pastry. Feel free to glaze it with beaten egg yolk. Cook for. I dunno. 25 mins? Good luck. 1) Not to be confused with a Drey. That's a squirrels nest. Flups, as a dear old (very old ) friend says. He's in his eighties. "How're you doing Bro'?" I ask in his regular phone calls. "Well, y'know 'ol chap," he says in his best ex-RAF voice. "Flups." Flups, Definition :- The process of being fed up and being made to feel somewhat loony, and being treated as such by others. Prob. combination of two words, unknown origin. Often expressed by ex-service personnel. Today, I am Flups. In Bro's case, he's a little infirm, due to his years. In my case - and I'm more than 30 years younger - because I have some some obvious and not so obvious annoyances. There was a television program back in the seventies about a disabled chap called "Does He Take Sugar?". Good title. It's something that you kinda get used to. People talking about you to someone nearby as though you don't exist. More, it annoys and discomforts people people if you are blunt and and say "excuse me, please don't talk about me as though I'm not here!" I accept the commonly held misconception that indeed, a Stroke (or a few) is a brain injury, and to them it follows that it affects our minds and logically, our intellectual capabilities. Ah, ah. Sometimes, but not always. I'm one of the 'not always'. I've had a few days, and not for the first time, when I've been 'reminded' that I should have provided goods, services or money to people. One cheeky bugger told me I was supposed to lend them some money. I wasn't particularly averse to the idea, I just didn't have the amount they wanted available. Their response? "You don't remember?" I pointed out I hadn't seen them in awhile, and I hadn't got it. "Oh," was the response. "I find that difficult to believe!" Another demanded I hand over a particularly expensive computer system and frosted glass desk that "I'd promised them". Got rid of them by pulling out my notebook, flicking through it, and asking when it was. "Er, doesn't matter". I'll bet. It's worse when they involve 'er 'indoors. Who is also my carer. That implies that my relationships are like THEIR relationships. However, my lass and I have been together 27 years, and through thick and thin together. You don't last that long in a relationship unless you talk to each other. Heck, in that department I've never had a choice! It's happened so often, I've become an avid note taker, and if I'm suspicious, I'll take notes in front of them. That puts off all but the die-hards. Not that I need to. Still, it's upsetting. So today, I'm Flupped. Bit of a wag my doctor. He'd given me a grilling about my eating habits, y'know the routine How, What, When. "Ah!" perfectly straight faced. "What we have here is a classic case of Bulimic Dementia." That got me. Never heard of that one. So I raised an eyebrow, and looked suitably unimpressed. "You look like you wolf it down, and then forget you've eaten it....."
To get my revenge, I'm going to pig out in a couple of hours on some real Man Food. 2 Home made Quarter Pounder Chilli Burgers with (sorta) Bannock Bread. 1 large Red Chilli Pepper, de-seeded, chopped very finely. 1 or 2 cloves of Garlic, finely chopped. 1 tablespoon of Hendersons relish. Mix the lot together, thoroughly, otherwise you'll end up with 'Chilli Bon Surprisé. Put it in the fridge for at least a couple of hours for the flavours to blend. The Bread. I prefer this for burgers to the soft white stuff from the supermarket. Bannock bread - my variation. 4 oz oatmeal - I used rolled oats. 4 oz plain white flour. A good 2 tablespoons of whatever fat you have available - I use butter. 4 (provisionally) tablespoons of water. Cooking the burgers. Divide into 2. Form into 'patties'. I'm sure these would barbecue well, if that's your thing. I prefer a preheated oven, gas mark 5 or 6 for about 20-25 mins. While they're cooking, mix together the dry ingredients for the bread. Heat up the water in a pan, add the fat, and allow it to melt. While you're waiting for the kettle, mix the water/fat mix into the dry ingredients. Set aside for a few mins, while you heat up a lightly oiled frying pan, skilitt, or griddle on the cooker. You may find you have some bread mix left - it keeps in the fridge for a couple of days quite well.